Valentine’s Day wouldn’t be complete without a decadent chocolate dessert. 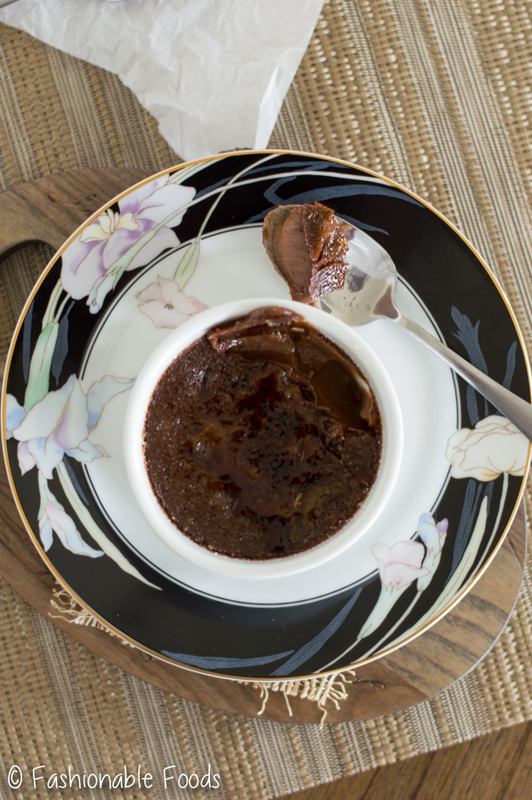 This chocolate crème brûlée definitely fits the bill and is sure to impress your sweetie! Welcome to another week my friends! Did you watch the Super Bowl? Eat tons of yummy food? (??) Drink a lot? If you did any of those things, I’m sure you’re dragging today. I’ve said it a hundred times before, but I only watch the big game for the commercials and the halftime show. Plus, it gives me an excuse to eat things like nachos and wings! I was in a food coma long before the halftime show even came on, but I did thoroughly enjoy Lady Gaga’s performance! The commercials on the other hand… not so much. Not one stood out to me or made me laugh. Which is saying something because I feel like it’s pretty darn easy to get me to laugh. As for the game, I simply don’t care about football at all, so I have no opinion there. ? 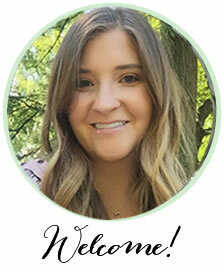 Now that football is over, let’s talk Valentine’s Day! Chocolate crème brûlée is quite possibly my favorite dessert. 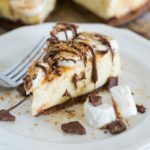 It’s creamy, chocolatey, and has the classic sugar crust on top. What’s not to love? 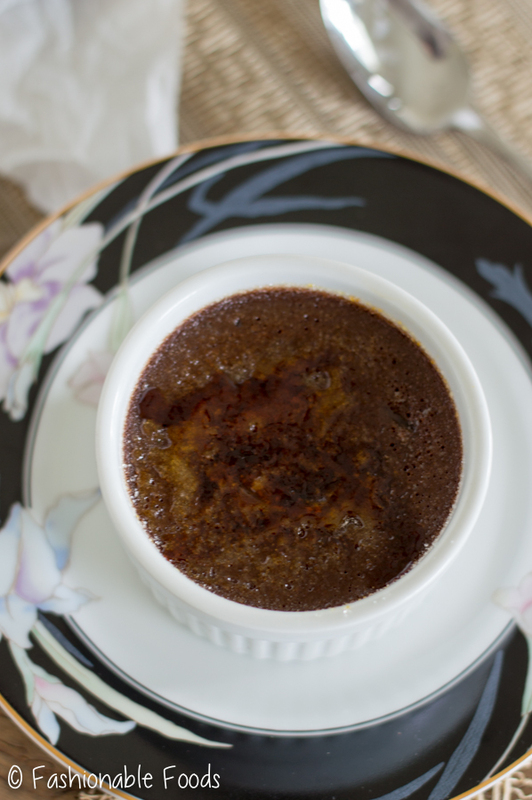 If you’ve never made crème brûlée, I promise you that it’s not as intimidating as it seems! You can make it ahead, plus it’s just a few simple ingredients. 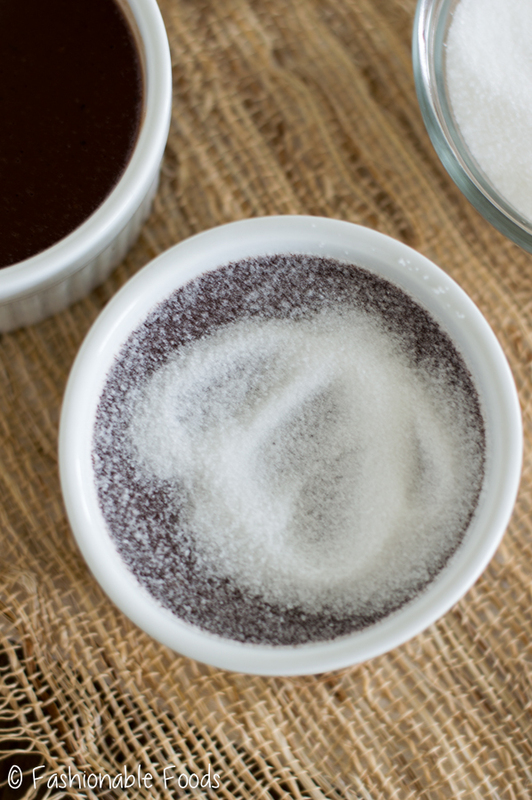 All you have to do is heat cream, some sugar, ground coffee, and a pinch salt together. 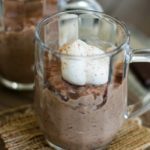 The coffee is added to help enhance the chocolate flavor and you can use whatever your favorite is. I always go with decaf in desserts in case anyone is as sensitive to caffeine as me! Once you have the cream mixture heated up, you’ll whisk in the chocolate until it melts. You’ll notice the coffee doesn’t dissolve – don’t worry, it’s going to be strained out later on. Next up, whisk egg yolks and more sugar together. Temper the egg mixture by adding a few ladles of the hot cream mixture, and then mix it all together. Now, strain the cream to get rid of those coffee granules, as well as any potential egg that may have started to curdle. Once you have the cream mixture strained, pour it into ramekins and bake them in a water bath. The crème brûlée will bake for around 35-45 minutes, or until the edges are set to the touch, but the middle will still be quite jiggly. 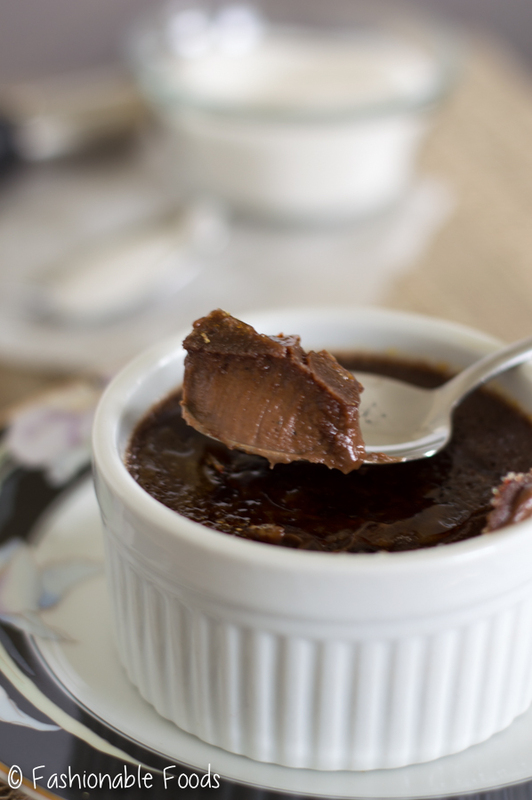 Chill the crème brûlée for at least 3 hours, but overnight is really ideal. Now comes the fun part! Grab your torch and “brûlée” that sugar on top! If you don’t have a torch, you can use your broiler, but this can be quite tricky depending on the type of oven you have. 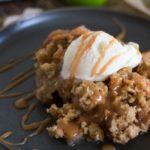 If you go this route, be sure and watch it like a hawk as you don’t want to completely burn the sugar, you just want it to be deep caramel in color. I do highly recommend you pick up a torch though.. they aren’t terribly expensive and a lot of times you can find crème brûlée “kits”, which include the ramekins and the torch. Plus, you can use the torch for many other applications in the kitchen. It’s perfect for toasting marshmallows when the craving strikes mid-winter for a s’more. Not that I know anything about that. ? 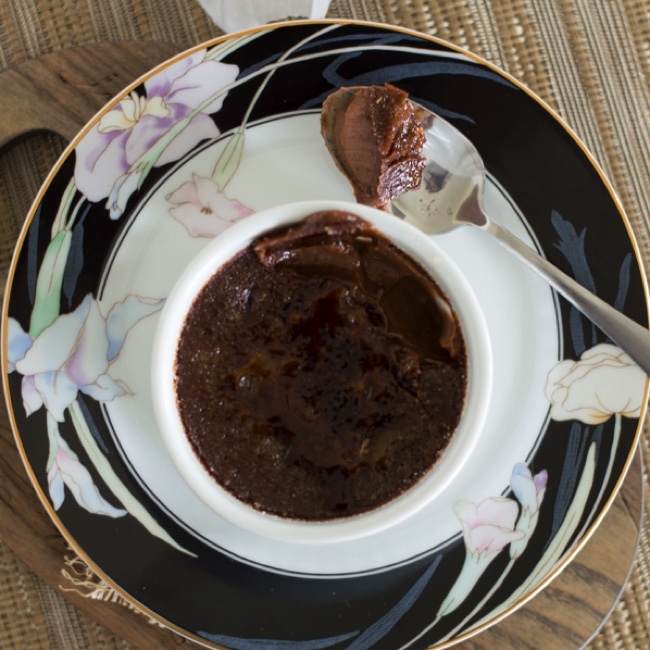 If you’re looking to impress your valentine, you definitely need to add this chocolate crème brûlée to your menu! And don’t stress, I’ve got you covered with an appetizer and a main dish recipe coming up within the week. Oh, and this recipe is written for six servings. I usually always need six servings as I typically make this for small gatherings (Christmas Eve, NYE, etc.). Even if I don’t need that many, I still make the whole recipe because I’m definitely not opposed to having leftovers in the fridge for when the craving strikes! However, if you only want 2 servings, I’ve included a cut down version in the recipe notes. Have a great week, friends! Preheat the oven to 300º. Place 6 (6 oz.) ramekins in a baking dish (9 x 13) and set aside. 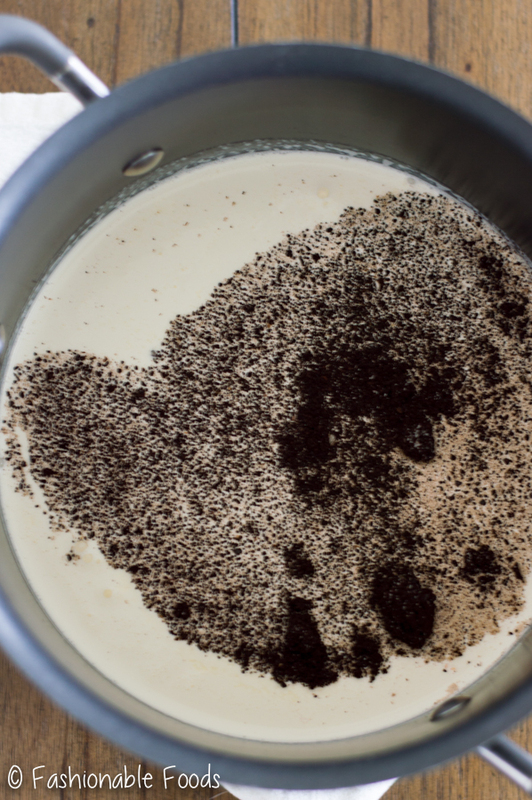 Combine the heavy cream, 1/3 cup sugar, coffee, and a pinch of salt in a 3 or 5 quart pot. Turn the heat to medium-low and whisk until the sugar is dissolved and the cream comes to a very low bubble. Stir in the chocolate and whisk until melted. Remove from the heat. (Don’t be alarmed by the coffee granules, as they will be strained out later). 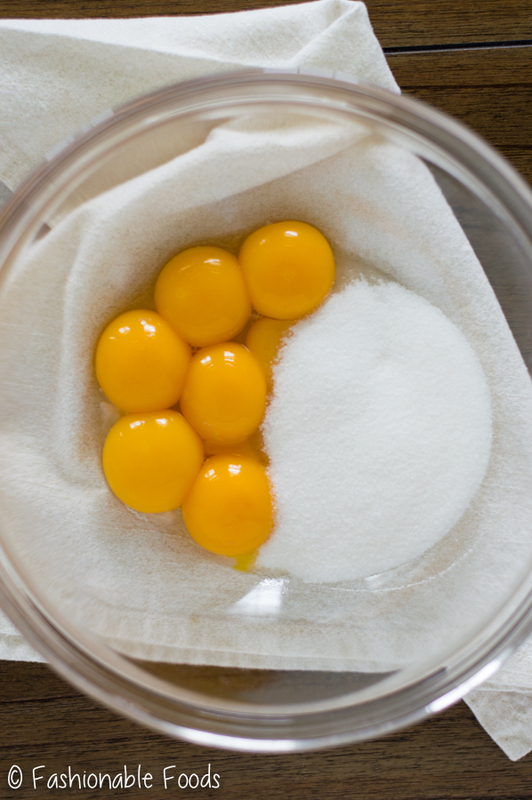 Whisk together the egg yolks and remaining 1/3 cup of sugar until well combined and pale in color. Slowly whisk in a ladle-full of the cream mixture, whisking vigorously to temper the egg yolks. Continue with another ladle-full, and then pour the tempered egg mixture into the pot and whisk well. Place a fine mesh strainer over a bowl and pour the cream mixture through the strainer. Discard whatever is in the strainer, and then pour the cream equally among the ramekins. Pour boiling water into the baking dish until the water comes halfway up the sides of the ramekins. Carefully transfer the baking dish to the oven and bake the crème brûlée for 35-45 minutes. When they are done, the centers will be very jiggly, but the edges set to the touch. Remove from the oven and carefully remove the ramekins from the water. 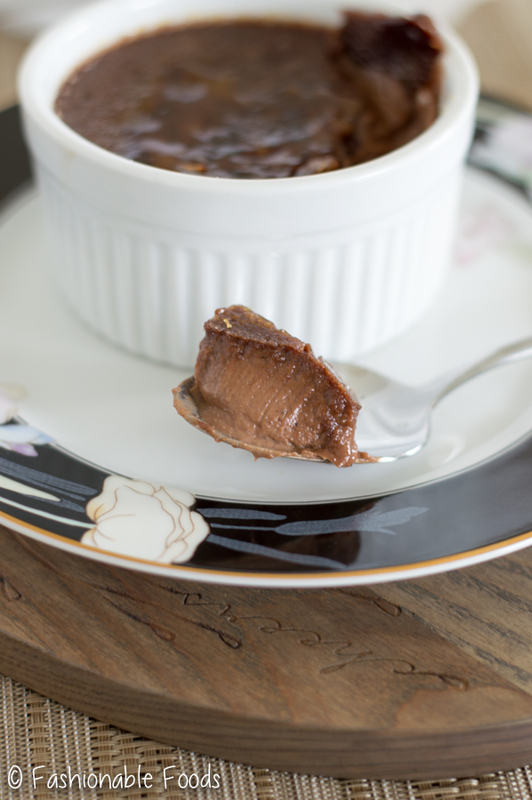 Refrigerate the crème brûlée until completely set, at least 3 hours, but preferably overnight. Top each crème brûlée with a heaping half tablespoon of sugar and use a kitchen torch to “brûlée” the tops. Move the flame back and forth over the sugar until it bubbles and browns, continue with each one and serve! *You can substitute 1 packet of instant espresso.